Social media banking. 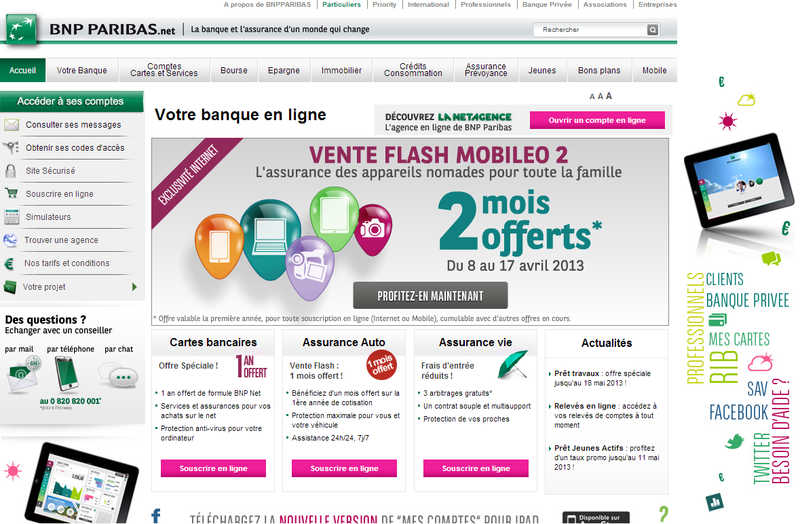 BNP Paribas is about to launch ‘hello bank’, a new 100% digital bank tapping social media. The bank aims to attract 500,000 new customers by 2018. Over the years, BNP Paribas established itself as a champion for banking innovation. The digital banking management team have demonstrated their commitment to be the first in France, and if possible worldwide, to launch new initiatives around online banking and mobile banking. The BNP Paribas Net Agence is a testimony of this. Their competitors would often argue that from the race to be the first comes half-baked initiatives which don’t necessarily leverage the native features of digital channels like BNP Paribas’ mobile banking app on ipad or a their ‘open a bank account in just one tweet‘ initiative. One has to acknowledge BNP Paribas’ fantastic marketing and communications machine: they are one of the smartest and most successful banks I know when maximizing the reach and visibility of those experiments. French daily Les Echos reported on Wednesday that the French bank will soon launch their new 100% digital bank which could be named “Hello Bank”. The project has allegedly a target of 25,000 customers by the end of 2013 and up to 500,000 customers by the end of 2018. Undoubtedly, BNP Paribas will aim to make the most of their experience engaging with customers digitally via their Net Agence, as well as their social media framework, guidelines and processes designed for tapping the power of social media banking and enabling social customer care on twitter and facebook. What are your thoughts on BNP Paribas soon to launch 100% digital, social media enabled, ‘Hello Bank’? Do you see this project as a real innovation in the banking industry, or another ‘marketing coup’? We invite you to share your thoughts about the role of mobile technology in banking, here, via twitter or on our Facebook page.